Please enjoy my second demo at the Bartlesville workshop. I think my effort on painting leaves starts to pay off. I decided to do a high key painting and I am glad I did. I have a funny story to tell you. After the first day of the workshop, we went to a Mexican restaurant for dinner. We were chatting happily with a lot of laughters. At this moment, a macho man sitting at the table next to us stood up walked to me. He tapped his big hand on my shoulder and said: "I just don't understand what kind of magic you have. How come you are the only man can get so many women around you." Everybody laughed. I don't know how to answer his question. I really feel grateful. I got so much support from all of you. These a couple of days. I got hundreds of email messages from all over the world wishing me happy birthday. I am so touched. What I can do is to improve my art further and share it with you. Thank you a big time. I am on my way back to Austin from Oklahoma. I had a wonderful workshop here. Thanks to Bartlesville Art Association and wonderful organizers Jo Ann and Elizabeth for making this event possible. Thanks to my old friends Venda, Buena, and Gail coming from long distance to see me. Thanks to all new artist friends for attending my workshop. I have enjoyed those three days tremendously. This painting is my demo at the first day of the workshop. I am in Bartlesville OK, teaching a workshop. After the class today, we visited the legendary lady Ms. Jody Kirberger. Jody owns the Telisman Gallery in this small Oklahoma city. 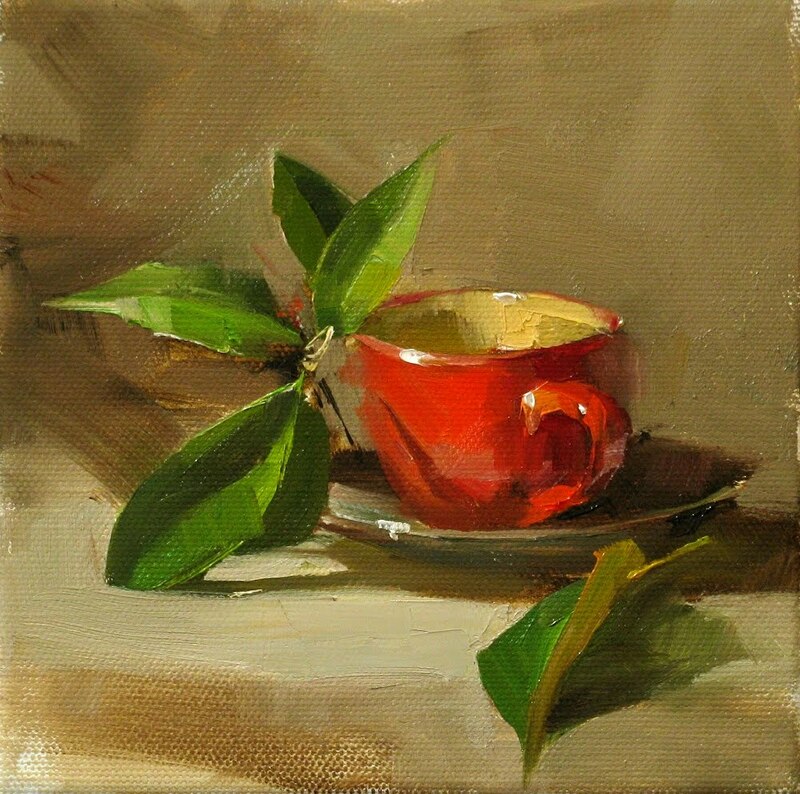 She has represented exclusively the Master Artist Richard Schmid for many years. I felt very fortunate visiting Jody in her lovely home. I was extremely happy to see her massive collection of Richard Schmid paintings and drawings. I was really amazed that in such small city, there is such extravaganza of the hidden treasure of the modern master. I am speechless. What an inspiration I had today! Thank you so much Jody! This week, I have been busy coordinating a painting workshop in Austin given by the famous figurative artist Zhaomig Wu. I have this dream for a long time, I want to bring top notch artists here and boost up art education in Austin area. Last year we had Calvin Liang, and this year is Zhaoming Wu. I will have more great workshops coming in the near future and I will let you know through my blog. My life is getting crazier, but Life is so short. I want to try all possibilities. I am continuing my research. I am working on grays with this one. I tried ultramarine blue plus transparent oxide red and adding white. It wasn't working. Then I replace ultramarine blue with phthalo blue. I got much better result. In this painting, I applied what I have learned from my recent leaf studies into more finished work. It is sort of worked, but not significant enough. Life is still going and research will keep going too. My recent posts are very left-brain-ish. I think it is necessary. At the earlier stage of the this painting, I really like it a lot. But I had to stop and went to work. I continued last night after I came back from work. The painting was semi-dry. I got out of control. Anyhow, this one is not bad. I like the color effect a lot. My exploration on leaves continues. I can't say much of progress on this one, but it did document my journey. I think the ability of painting leaves can connect the both still life and landscape painting together. We have talked about that very few artists can do both well. I believe painting leaves will help for sure. I don't know what has happened to Blogger. It was down for a long while. Thank God it comes back. When you deal with computers and the Internet, please remember: no matter how powerful and convenient these tools seem to you, They are the most UNRELIABLE tools. If you want to have a good life, please set your foundation on something else. Do not worship technology, because the main purpose of technology is to make a small group of people rich. Providing convenience and enjoyment is quite secondary. If you were addicted to technology, you were doomed. If the world is addicted to technology.... I stop here. I have been working in high tech all my life. I do learn something. I did another leaf painting. I am not addicted to leaves. I do this because I see a tangible way to bring my art to the next level. I really appreciate many people's compliment to my work, and I will continue sharing artistic enjoyment with you. However, I am not a master. I just like to paint. I went to portrait painting last night and the model was very beautiful. I enjoy painting people and try to make the composition of portrait painting more interesting. I am also very interested to know if this kind of portrait painting is marketable. So I am going to do a test. I will auction out this painting with very low starting price, and see how it goes. We are almost at the middle of the year. So I would like to provide you my 2012 painting workshop schedule. I have planned 12 workshops for the next year. If you are interested in my painting approaches, please find one of my workshops near you and contact the organizer for detailed information. I am looking forward to working with you. If you are one of the workshop organizers on my list, please check if I have placed the information correctly. If you are interested in hosting my workshop at your location, please let me know, We will find future opportunity. Thank you. "I try to depict the lush foliage by delineating only three leaves". Did I use the two "D" words correctly? Thanks to so many of you helping me by explaining the difference between "depicting" and "delineating". In the company I work. there used to be an engineer friend, Al. He helped me in English and American culture. We call every Friday: Qiang's culture day. I learned a lot from him. Now he has retired. I really miss Al and the culture days. Now I have expanded my culture days on the Internet. Wow! "I said to myself, what a wonderful world!!!" My today's painting is a plein air piece. I did this with the "Plein Air Austin" group at Manor (east of Austin). It was done mainly with my newly obtained flexible palette knife. I was very clumsy with it at this moment, and some of the effect I want did not come out. But it is all right. I am happy to see "rooms" in my painting I can "reserve" for the knife work. Wow! "I said to myself, what a wonderful world!!!" I feel happy about this one. In my standard, my art has been dwindling in a plateau stage for a long time. These a couple of years, I tried many approaches. However, I have not seen any real break through happening. Now this one is interesting. Why do I say so? Well, let us compare this painting with the one I posted previously. When you see that one, you may say: you painted 5 leaves. However, when you see this one, you may feel I painted many leaves. But that fact is I have seriously painted maybe also 5 leaves. How to make viewer lose count with very low numbers of things depicted is the drama I want to achieve with this painting. I have seen some of Richard Schmid's paintings. You feel he had painted a bush of lush foliages, but if you count, you will find that he only painted 3 leaves with details. Now I come back to do small painting, and continue on my study on painting leaves. I have a similar leaf arrangement as my demo posted previously, but I got more time working on it. The high key purple background really enhances the green leaves. BTW I have received the flexible palette knife (Holbein 10667). I start to practice using it. Instead of auction on eBay, I am going to try the new DPW auction. Please let me know how you like this new way to buy my art. Thanks. Last Saturday I went to Marble Falls, TX. The Riverbend Fine Art Gallery was hosting the reception of a 3-man show of Rusty Jones, Bob Rohm, and me. All three of us did demos that day. This is my demo painting. Since I am working on leaves, I included some of them in my setup. I placed a red apple right under the leaves, and it feels like the apple has fallen right off the branch. It reminds me the story that Isaac Newton discovered the gravity because an apple fell on his head. So I named the painting: Newton's Apple. This 3-man show is a new milestone to me. This is the first time I have shown relatively many paintings with a small group of artists. I met quite a few new friends and really had a lot fun at this beautiful Texas Hill Country town. I want to thank Marta Stafford for organizing this event. I want to thank all my collectors for their support.